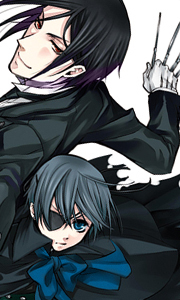 Ciel Phantomhive is the most powerful boy in all of England, but he bears the scars of unspeakable suffering. Forced to watch as his beloved parents were brutally murdered, Ciel was subsequently abducted and violently tortured. Desperate to end his suffering, the boy traded his own soul for a chance at vengeance, casting his lot with the one person on whom he could depend: Sebastian, a demon Butler summoned from the very pits of hell. T..
Own Black Butler - Complete Season 2 DVD from Deff, DVD, Blu-Ray & 4K Video Specialists - Free UK Delivery..
Own Black Butler - Complete Season 3 Blu-Ray from Deff, DVD, Blu-Ray & 4K Video Specialists - Free UK Delivery..
Own Black Butler - Complete Season 3 DVD from Deff, DVD, Blu-Ray & 4K Video Specialists - Free UK Delivery..
Own Black Butler Season 3 Blu-Ray from Deff, DVD, Blu-Ray & 4K Video Specialists - Free UK Delivery..